Just got back from a couple weeks in the UK - researching, attending the Oxford Symposium, and visiting several museums to study the elaborate roasting ranges with smoke jacks, iron wall ovens, early gas and steam apparatus. AND saw an original Slater Steam Kitchen (early 1800s). Sooooo.... here is a British cooking range. 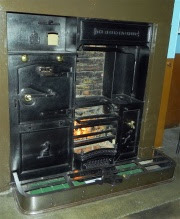 The fire box of the range, in the center, could roast meat hung in front, and heat water in the adjoining boiler. The oven on the other side was circled by a flue containing some heat from the fire on its way up to the chimney. The metal plate on top was hottest over the oven, thus used to boil vegetables and further away the temperature decreased and plated could be warmed on the top. Less coal or charcoal was needed when using a range than a hearth. The photograph above is a Kitchener range made by Walker (of York) and is on display in the Castle Museum of York.